eBay has many working 8-day clocks. And a good watch repair shop can often fix them. I'm putting one on my RV-3B. Or quicker, search DanH's postings. That'll be fun to certify with the FAA. Yes, but it's marginal for an RV-3B. I described what I did in my VAF blog, (http://www.vansairforce.com/community/showthread.php?t=85658) posts 242 through 245. I believe mine does. I have that engine and it's got the plug in the back of the recess that starts at the crankshaft flange, the plug that (still) needs to be removed. I like the above suggestion. And that's correct - the same pressure for both. Second the advice for the A2 sealant. I got some from www.skygeek.com, which has a nice variety of tank sealants. Help, How do we insert a picture? The photo with the arrow is too wide for my 15" Macbook Pro. 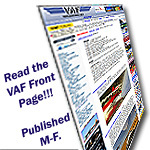 On my VAF project blog, (http://www.vansairforce.com/community/showthread.php?t=85658) I reduce the photos to 800 pixels wide. That's a good idea, Bill. You ought to put it in Tips. I'll bet it would help out a few people. Here is the final seat riblet being glued in. I’m using a small heater to keep the epoxy warm and speed the curing. MY center section had a different number than the spars, so I contacted Van's. I was told that they were now effectively interchangeable. Any value in a Continental O-470-U , 230 hp and a 2 blade prop. As a 180 owner, I'd love to watch this thread grow. But as an RV-3 builder, I have to admit that there's no perceptible RV content here. It should be in a more suitable place rather than VAF. I got a pound of hardened finishing nails from Home Depot and they rarely break. I've only used a few. No tips for the install, I had mine done by a shop. But I agree completely with the favorable comments. It's a very nice unit, and has a great display. Still, it would be a good thing if there were some ability to identify the part that failed, and since the failure is benign by design, identify that a failure has occurred at all. You need something like this, in an appropriate size. Thanks, I enjoyed that. Great photos and it's sure good to see an RV-3 actually being used. You can get a copy of the plans on a thumb drive from Van's. Ask for p/n FD PLANS RV-12. It costs $10 and has all the steps. Now both the seat and the baggage floor are pilot-drilled. A couple swipes with a flat mill file, held flat on the surface, does an outstanding job with those burrs and does no other damage. This thread (http://www.vansairforce.com/community/showthread.php?t=136938&highlight=Fry) includes photos and a link to the RV-4 Fry jig instructions that you can download. Kinda depends on where you are. At my field elevation, 5,050', we lean for takeoff or go-around. Full rich means a noticeable loss of power. Regarding flats, I've had one, count them, one, flat in the 8" pneumatic tailwheel tire for my C180, in about 1,500 hours. And I've flown into all sorts of strange places. It's pretty enough, but just how big is it? It looks huge. And the cockpit looks like a lot of thought went into it, too. You're probably thinking, huh? Architecture? The 406 ELTs are considerably more effective than the old 121.5 units. Worth changing if you haven't already, and remembering if you are planning to install one. Ages ago, I was living in Lancaster, CA, on the Mojave desert. One day I rented an old Champ and flew it out to the west end of the valley. I'll never forget the poppy superbloom. To me, anything more than an occasional roll simply isn't fun. Your poll presumes that the activity is fun; to me it isn't. How does the torsional stiffness compare to the stock one? Don't forget to flutter-qualify it! And since the area looks reduced, be sure to run it through the full set of lateral-directional stability and control tests. The drawing isn't accurate. Here's what I started with. Then I used some curves and faired it from there. Seems to be okay. Here's what I started with. Then I used some curves and faired it from there. Seems to be okay. At Longmont, don't overfly the center of the field - that's where the jumpers land. They seem to be under canopy by 8k', usually, and the jump plane calls the drop on CTAF. So far, the shipping is running just under 4% of the total. Thanks, Larry, for posting the part number and source name. Saved me looking it up. They have good service. This is mine. It's from the 2017 Van's calendar. The airplane is an RV-3, which works for me. If it won't fit in my bandsaw, I simply use a hacksaw. It's abut as fast. In fact, it's just not an issue. You might as well start the company up. My C180 weighs as much as Paul's Tundra and heck, while I can still push it around, that 1" edge on the hangar floor is getting harder. Trouble landing your 3, me too. Man, that was great! Thanks so much! And if you'd be kind enough to send me the lyrics, that would be the icing on the cake. Heck, I'd be thrilled merely to have a higher Vne. Just that. Essential Bus and how often do battery contactor's fail? I had a contactor fail on a certified airplane, fortunately on the ground. In this case, that would not have helped. It could be cut in more than half. Bonding is adequately strong, according to the pull samples. You'd still need rivets in a few places, though. It's not a trivial matter to prepare aluminum for a reliable bond. I'm sure that others are more knowledgeable than I am about that.